Participants discussed applications of deep learning to problems of interest to cryoEM. These included particle picking, selection of appropriate 2D classes, decisions on the numbers of 3D maps, segmentation of tomograms, etc. 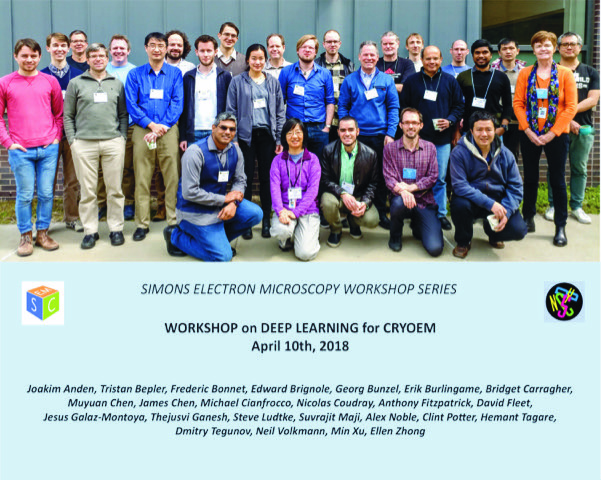 The goal of this workshop was to bring together machine learning experts and cryoEM practitioners to discuss the use of deep learning methods to applications in cryoEM. The Agenda is below. The workshop was webcast to YouTube and then content available here. PDF versions of slides that have been made available by the speakers can be found by following the links attached to the speakers’s names in the agenda below.